This quick Chicken Pho uses an Instant Pot to get all the flavors a long simmer would give you. 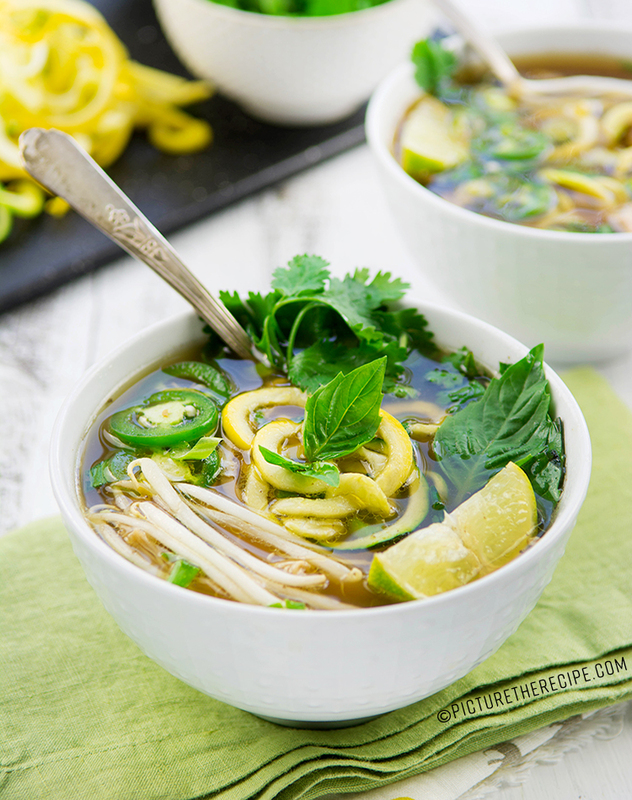 It’s so healthy, easy and delicious you’ll be making this recipe PHO-EVER! 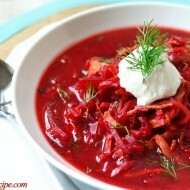 There’s nothing quite as comforting as a bowl of soup when the weather starts to cool down drastically. I happen to love clear broth style soups and Vietnamese Pho…is way up there with some of the best broth soups. 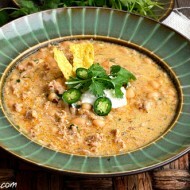 It has a developed complex flavor of charred spices with rich beefy goodness. The broth is traditionally made by slow simmering beef bones with marrow & the tougher cuts of meat along with fire charred onion, ginger and spices like star anise, cloves and cinnamon for a long-long time. The bitterness of the charring is balanced out with sugar and fish sauce for a more rounded flavor. The pipping hot clear broth is then poured over rice noodles and topped with an array of garnishes like, green onions, bean sprouts and hot chilies. 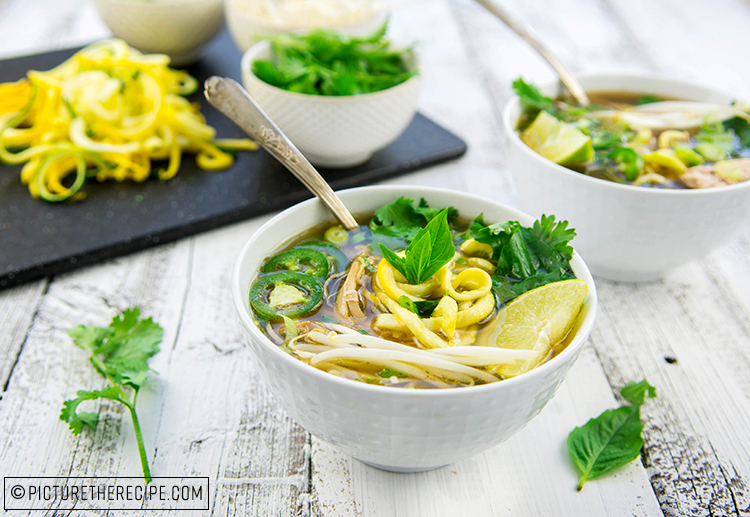 Bright vibrant fresh herbs like cilantro, mint and thai basil bring the soup to life and a very generous squeeze of fresh lime juice completes the perfect bowl of soupy-noodle goodness! You want some Pho now, don’t you? But you don’t want to wait 8-12 hours simmering a broth to extract all that flavor, now do you? That’s where this instant pho comes in. Granted it’s chicken pho (known as Pho Ga) and not pure beefy goodness pho….but it’s still packed with the same traditional Pho spices and flavors, but only takes 30 minutes tops to make in a pressure cooker or Instant Pot. You can make it paleo like I did using zucchini noodles instead of rice noodles and customize the garnishes and topping to your tastes. It really is a cheat version getting a ton of flavor from the meat by pressure cooking it, in a fraction of the time it would take to simmer. In my books, it’s the perfectly easy and quick weeknight dinner that you’ll be making Pho-ever once you taste it. Here’s how you can make my version of Chicken Pho (Pho Ga) with Zoodles and as always…please do comment below if you like or try out this recipe. 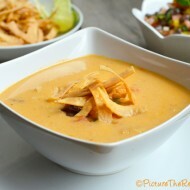 Also I would love to see your dishes on Instagram and Facebook so tag me @noreen_picturetherecipe (instagram) and share them on https://www.facebook.com/PictureTheRecipe/ or simple tag them with #picturetherecipe. This quick Chicken Pho uses an Instant Pot to get all the flavors a long simmer would give you. It's so healthy, easy and delicious you'll be making this recipe PHO-EVER! 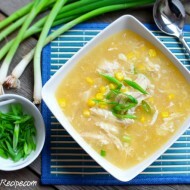 - Take half the green onions and slice into big pieces for the broth, keeping the roots intact. Finely slice the remaining green onions and set aside for garnishing. - Take a handful of cilantro & thai basil and tear off the leaves and set aside, saving the stems for the broth. - Spiralize the zucchini/squash into noodles and set aside. - Add the diced onion and sliced ginger and allow them to char without stirring much. - Add the coconut sugar/sugar, fish sauce, water, cilantro & thai basil stems to the pot. Add salt to taste. - Cover, set vent to sealing position and set on manual mode- 8 minutes- high pressure and allow to natural release. - Once the float valve sinks, open the lid carefully and take out the chicken pieces. - Peel the skin off the shred the chicken taking it off the bone. Discard the bones & set the meat aside. - Place the zoodles in a bowl, add some of the chicken pieces and pour the hot broth over it. - Garnish with cilantro, sliced green onion, mung bean sprouts, thai basil leaves, sliced jalapeno and generously squeeze lime juice over the whole soup. Serve with extra lime wedges & garnishes on the side.